I shall be jotting down steps and give product recommendations side by side. Also, there are some tips hidden. So make sure you stay with me till the end! (alert: irksome acne pics ahead!) Products marked in blue are clickable links to their respective review posts. 1. Makeup removal: Whether you use makeup or not, I highly recommend you use a cleansing balm/oil to melt down all dirt, grime, sebum and deeply cleanse the skin. My fav: Banilla Co. cleansing balm. 2. Facewash: It is extremely essential to use a low pH cleanser (below pH level 6) to keep the acid mantle of the skin unharmed. My favs: Cipla Saslic facewash, Vya naturals Vit C facewash. 3. Toning: Though just an added step, toning helps in removing those pesky little grime particles which otherwise might end up clogging pores. I suggest you use an AHA based toner in the evening which will provide mild exfoliation as well. My favs: Tvakh exfoliating water, The Ordinary 7% glycolic toning solution. Hydration is the key to keep your skin soft and supple. And in the process of drying up acne, we end up drying our skin as well. Hence after cleansing, it is time to replenish the skin with as much hydration as possible. 4. Essence: (optional) These are almost water-like, hence can easily be layered up. Also, adding a layer of hydration harmed no one. My fav: Vya Naturals Vitamin C serum. 5. Serum/Emulsion: (optional) I never skip this step. There are times when I’ve skipped a moisturizer but never a serum. These add so much hydration without clogging the pores, when chosen wisely. My fav: It’s Skin clinical solution AC emulsion, It’s Skin PO effector serum, Innisfree Green Tea balancing lotion, The Ordinary niacinamide. 6. Moisturizer: (optional when 4 & 5 are used) The last and final step in a skincare routine. I prefer mild ones for daytime & heavy duty moisturizing ones for night time. These can also be skipped if enough moisturizing emulsions are used. My favs: (AM) Loreal revitalift Laser X3 day cream, Apieu Madeccassoside gel cream, Pyunkang Yul moisture cream. (PM) Plum green tea renewed clarity night gel (when mixed with oils), Skin&Lab barrierderm intensive cream. Use a clay mask as a spot treatment, only over the affected area. It will dry it out. My fav: ENN AC NAY anti-acne face mask. Never use physical scrubs on acne prone skin (you wouldn’t want to rub a wound with a coarse product, right?) Try chemical peels and you’ll never look back to physical scrubs. My fav: Innisfree peeling wine jelly softener, The Ordinary AHA 20% + BHA 2% peeling solution. Use Pond’s pimple clearing gel as a leave on spot treatment. It clears pimples by removing the bacteria from pore level. Use green tea mist. Currently, I am loving Innisfree green tea mist. Always use a sunscreen during the daytime. It looks as if sunscreen is a solution to all skin problems. My fav: Tvakh super AM sunscreen spray, Aroma magic aloe vera sunscreen gel. Use Tamanu oil to get rid of the pigmentation left behind, quickly. Don’t apply tea tree oil directly over acne. Too much of it can cause extreme dryness. After all it has been through, this is how my skin looks now! Phew! 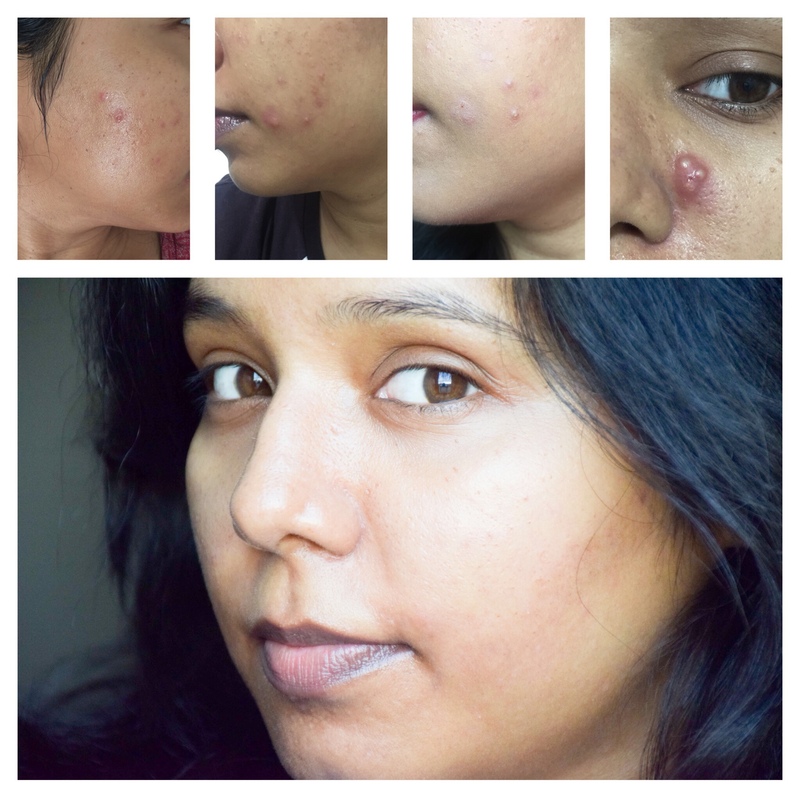 These were the tips & products that helped me get rid of my acne and improve my skin texture. I still break out from time to time but that’s totally manageable and normal. It’s never too late to start taking care of our skin. If you need an individual post on any topic, do let me know! Would love to make one for you. Disclaimer: I am only sharing my experience and the products that suit me. The ones which worked for me might not work equally well for you. Thanks my dear!! Let me look more into deram-e overnight peel. Thanks my gurl! Do share it with someone in need. Superb post! This will be useful for all people with acne-prone skin. Also can you review The Ordinary niacinamide? You write great articles Bhumika! I am definitely going to come again and every tip is helpful. i have gone through the same so I can pretty much relate everything to you. Bad skin is like a bad day, it does not stay for long. One must be always positive and keep doing the right thing. Physical exfoliators are so bleh! 🤦🏻‍♀️🤦🏻‍♀️ Nonetheless, better late than never. Your skin looks very clearer. Almost all the acne spots are gone. Guess it’s because of the products you’re using. Yeah! Thank you so much my dear. I am very much happy to finally see your fabulous skincare routine. Am using(AM) kama mirdul soap free cleanser, Elixir toner, innisfree green tea serum, innisfree balancing lotion, Tvakh colloidal oats broad-spectrum sun guard, Seer secret Lavender mist. (PM) kama mirdul cleanser,Tvakh 5%vita c glow booster,Elixir acne serum(if zits popped),Elixir Zaria serum,Tvakh aloe grapeseed gel. Mask- Tvakh anti acne mask or Elixir activated charcoal mask. Bhumika have you tried Elixir products? Are you using Ordinary niacinamide serum after vitamin c essence? Hi Bhumika, you’re skin looks really great! Thank you so much for sharing your tips. I really hate it when I have acne breakouts. I’m still trying to find the right products for my skin and having a skincare routine. Learned a lot from you today thanks! I am glad I found you…thank you for helpful tips and recommendations…My skin is actually behaving badly after shifting to Goa.